I did not particularly enjoy myself over the last few weeks. Packing up an entire household is not what I call fun. Boy, am I glad that is behind us. 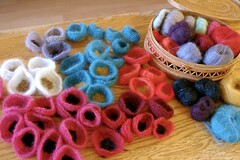 For days and days on end I was not able to play with yarn and knit. So when we arrived back in San Francisco last Tuesday, I grabbed my little wooden basket filled with kidsilk haze yarn and started to knit poppies. 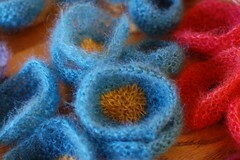 It sure was a pleasure for the eye those sweet little colorful knitted flowers… I wish I had taken a picture! I will leave the poppies with message attached randomly in neighborhoods. On a bike, on a doorknob, on a bench, attached to a fence, in nooks and crannies, in somebody’s mailbox, in restrooms, on branches. Because we need that feeling of endearment… We need to let our guards down every once in a while and I hope that these little poppies will disarm and endear. This entry was posted on Thursday, May 13th, 2010 at 9:43 pm and is filed under Knitting. You can follow any responses to this entry through the RSS 2.0 feed. Both comments and pings are currently closed. “We need to let our guards down every once in a while…” YES! You are so right! To much of the time I’m guarded and closed off. I’m going to pretend I just found one of your poppies. Such a great idea! The trick is to know when you should be guarded and when to let it down, yes? It is quite a skill to let your guard down at the right moment. I am still figuring it out 🙂 I am loving how you love your photography classes! That’s a really beautiful idea….it touched me and I didn’t even get a poppy to go with those inspiring words!…GREAT IDEA!! Dazzler, is that you? Knitphomaniac, hahaahahaaa! I am glad my idea touched you 🙂 Thanks, honey… you inspire me. Nancy, I love the way you think; and not only do you think great things, but you follow through with them. Please update us after their ‘release’. Are you going to hide and watch for recipients reactions? 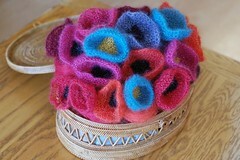 Renna, be sure to get updates from when I set the poppies free! I will take pictures where I left them. Although, I would love to see people’s reaction, I think I will not be there to experience it… But can only wish they will have a positive reaction! Nancy, we need more people like you in the world. seriously. i know that you’re super far from where i am, but little do you know that there have been a few posts of yours that have helped me a lot… not only with my knitting, but life and realizing what truly makes us happy. i dont want to make this a long winded comment… but i do want to say… thank you 🙂 l love the poppies… and i love the idea… so awesome. Telma, thank YOU so much for reaching out and letting me know this… Isn’t this social media thing mind blowing? I am so happy we connected and that we can positively influence each other. For reals. Sondra, surprises of inspiration are all around us, yes? Often times they are untangible. And then we realize we can make them tangible… how empowering…So happy, Jenni is here!